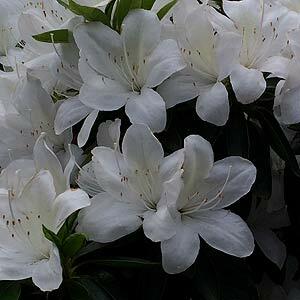 One of the best Azaleas for a combination of fragrance and masses of flowers is Azalea ‘Alba Magnifica’. Flowering in late spring, if properly pruned and cared for you be rewarded a bush covered with large white flowers with a good perfume. It is naturally a vigorous grower and takes well to being shaped. Like all azaleas, Azalea ‘Alba Magnifica’ will grow well in full sun to part shade. We find that flowering is better and longer lasting in a position sheltered form the hot afternoon sun, yet with plenty of light. A humus rich free draining soils essential, and a slightly acidic soil is required for best growth. When planting, dig in some well rotted compost a few weeks before. Water in well and then mulch around the plant to maintain a cool root run and moisture. Use a specialist Azalea and Rhododendron fertilizer to help maintain good growth and appropriate soil acidity. Azalea Alba Magnifica Summary Information. Height – To around 1metre in height. Position – Best if dappled shade, or morning sun. Flower colour – Pure white. Although you can get away with little pruning at all, for best flowering and to maintain a compact shape you will need to prune once a year. The best time to prune ‘Alba Magnifica’ is directly after flowering. Try to do this regularly and the need to hard prune will not arise. All azaleas like a cool root run, so mulch around the plant out to the drip line each spring. It is a good idea to use different mulches each year, content use of wood chip mulch can lead to hydrophobic soils. Brown mushy petals may mean ‘Petal Blight’, this is a fungal disease usually associated with high humidity and poor air circulation. Remove old flowers and dispose of them in the rubbish. Apply a fungicide if the problem persists. Azalea lace bug leaves patterns on the foliage. This can be treated with confider, either sprayed on of in pellet form applied to the soil. Azalea ‘Alba Magnifica’ is available both as a bush and as a standard, the standards look fantastic in a formal garden. Both types grow well in the ground as well as in containers. If container growing use a largish container and high quality potting mix. Azalea ‘Alba Magnifica’ mixes well with Camellias, Rhododendrons, Aucuba japonica and Piers japonica. It cam be underplanted with Hostas, Hellebores, Trilliums or spring flowering bulbs that grow well in part shade.